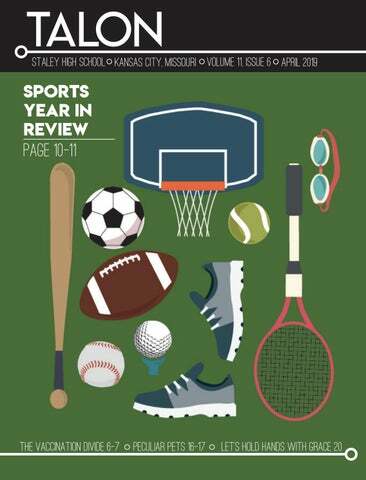 As this is our last official issue for the school year, Talon decided to highlight each sport and how they performed. Keeping with the minimalistic style, yearbook editor senior Haley Anne Mahusay designed the cover. Talon publishes seven issues during the school year. Talon will accept letters to the editor in CR202 or at cherie.burgett@nkcschools.org. Before the letter is published, we will need to verify the writer’s identity with a photo identification. Letters may not exceed a length of 350 words. We will not publish letters that are libelous, obscene or that may cause a veritable disruption of the education process at Staley High School. Letters must be signed. Anonymous letters will be discarded. Advertisers may contact the adviser at cherie.burgett@nkcschools.org, (816) 321-5330 or at 2800 NE Shoal Creek Parkway, Kansas City, MO, 64156-1313. Opinions expressed in Talon do not express the staff’s endorsement of the products or services. Talon is a member of NSPA, MIPA and Quill and Scroll. Talon is affiliated with JEA and JEMKC. PR 400m - 52.16 sec. PR 200m - 25.69 sec. chools strive every day to keep students safe. There are different methods to ensure safety, such as disaster drills, autolocked doors, background checks and other policies put in place to protect students. A particular method with this same intention is the staterequired vaccinations to attend school, although these vaccinations have been controversial. Some believe more harm than good comes from them and choose to not vaccinate their children entirely, but others say this decision endangers other students attending school. Currently, anyone with a medical or religious exemption can opt out of vaccinating and still attend school. Vaccine Exemption hotspots Throughout the United States, there are 15 cities that have a cluster of non-medical exemption rates. These cities are called “hotspots” for anti-vaxxers. The Public Library of Science found that Kansas City, Missouri, was one of these few hotspots in the country. because many vaccinations carry live versions of the illness in order to make the body fight it off, but immunocompromised people often don’t have an immune system strong enough to ward away the disease. aluminum, lead and formaldehyde force the immune system to respond. It’s honestly really scary if you consider what it could be doing to your brain,” said Lynda Gammal, an anti-vaxxer with a Ph.D. in Pharmacology and Toxicology. more protected from the virus. “We just had an infant die from the flu a couple of weeks ago. He was too young to be vaccinated for it,” said Ludanick. Should Students whose parents choose to not have them vaccinated be allowed to attend public school? oys volleyball club started in March. Sponsored by The Heart of America region of USA Volleyball, each of the four high schools in the North Kansas City School District has a team. The teams compete in the Kansas City High School Boys Volleyball League. Currently, the club is using the gym time that is available for their open gyms. Due to spring sports taking precedent over club sports, the volleyball club typically receives later times of the day for gym time. “We just practice when we can, and we say thank you. We are doing the best we can,” said volunteer coach Ken Corum. Senior Chad Kirby attended the open gyms and is making the transition from tennis to volleyball. Why’d you decide to play? t the Platte County tournament April 1 at Shiloh Springs golf course, sophomore Nate Thompson tees off. The team placed second out of eighteen teams. “The season is going pretty good. 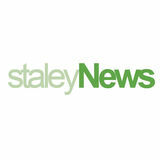 I think the team is doing the best it ever has at Staley,” said Thompson. spot because our able-bodied students decided to take the handicapped spots. In Missouri, the fine for parking in a handicapped spot can vary from $100-$300 plus additional administrative fees. That is just in a public parking lot, though. In the school parking lot, cars can be ticketed for $25 by the resource officer on duty. Those tickets may seem annoying, but they should still be treated just like any other type of ticket. The problem of parking in a handicapped spot all goes back to the morals, entitlement and straight up laziness, and frankly, it is just sad to see people think they are entitled to take that spot from someone who may actually need it. wARNER WEIGHS IN: DON’T IGNORE OFF BRANDS Cocoa Crisp Rice VS. Cocoa Pebbles The name brand, Cocoa Pebbles, costs $2.20 more at Price Chopper than the off-brand Cocoa Crisp Rice. The Cocoa Pebbles have a bigger box with four more ounces of cereal. Ultimately, what matters is taste, and they taste the same. So, you can save more than $2 to get the same cereal. It is ridiculous not to buy the off–brand. The price difference covers the extra four ounces of cereal. Right Choice Crispy Rice Flakes With Strawberries vs. Special K with Red Berries Special K costs 96 cents more than the off-brand at Price Chopper. Also, there is a disappointingly small number of dried strawberries in Special K. However, Special K does have about four more ounces of cereal. Once again, they have similar tastes, but Special K seems to have fewer berries. Peanut Butter Cocoa Spheres VS. Reese’s Puffs The name brand, Reese’s Puffs, are 50 cents more expensive than the Best Choice Peanut Butter Cocoa Spheres at Price Chopper. Also, while there is not a big difference in taste, Reese’s Puffs have a different texture. This isn’t necessarily a bad thing, but the Reese’s Puffs have more of a powdery texture to them. Also, there is a recipe for a trail mix on the side of the Peanut Butter Cocoa Spheres box, making the off–brand a great choice. Honey Bunches of Oats costs $1.10 more than the Right Choice version at Price Chopper. The biggest difference is that Right Choice doesn’t have the “bunches” that Honey Bunches of Oats does. It is just cornflakes, but the vanilla almond flavor makes them taste the same but have different textures. Right Choice has a smaller serving size than Honey Bunches of Oats, but Right Choice also has less sugar per serving and fewer calories. Both have the same flavor, but sometimes the Right Choice texture is easier to eat. oing back and watching this 2009 animated film was honestly like experiencing it for the first time all over again. Even though I already knew the plot and how it would end, the characters and humor were more than enough to keep it interesting. I think this is a good example of a film that ends up getting overlooked throughout the years, because it had to compete with dozens of other childrens movies being released. The concept was unique, but appreciating the dialogue is the key to enjoying this movie to the fullest. “Cloudy with a Chance of Meatballs” truly was ahead of its time, and I regret the fact that younger me didn’t focus on it enough. his singular movie led to a trilogy that shaped an entire generation of kids. I can say with complete seriousness that “High School Musical” contributed to my personality today. Everything about this movie is over the top and super dramatic, but this aspect gave it the power to become such a cult favorite. I had this movie on repeat when I was younger, and I don’t think much has changed. The musical numbers are super catchy, and I’m sure most kids who grew up with this movie could still sing along today. This movie may not have a lot of depth, but the happiness I get from watching it easily makes up for that. k. First of all, all jokes aside, this movie is actually really interesting to watch when you forget about the bizarre plot. With that being said, how on earth is this a PG kids movie? Many only remember “The Bee Movie” for its unconventional romance between Vanessa and Barry B. Benson, but the entire movie is weirdly political and contains humor that requires at least some adult knowledge. As a child watching this movie, I honestly had no idea what was going on. Watching this in 2019, the message portrayed throughout the film is actually rather intelligent, even if the characters are disturbing. I think this movie was meant to be more enjoyable for the parents of the children going to see it rather than the children themselves. here are no words to properly describe the quality of this movie, but two I would use are timeless and masterpiece. Disney and Pixar really created something beautiful when this film was released in 2009. As soon as you’re five minutes in, you’re hooked for the entire thing. As a child, this was one of the only animated movies that made me feel a variety of emotions throughout watching it. This film is one of the most wholesome stories among any genre and any demographic. Not only was the plot beautifully constructed, but the characterization was well done and made me feel a connection to those characters. I loved this movie as a kid, and I absolutely still love it now. o this very day, this is Selena Gomez’s best work. This movie is the most cliché, rich-boy meets underdog-girl story there is, and I absolutely love it. Some movies are just so wonderfully bad that they become a childhood staple and a favorite for years. Truthfully, when I was younger, I believed this was a super unpredictable and amazing movie. Watching it now, the dialogue is obviously cringy and very 2008, but somehow it’s still very entertaining and overall enjoyable to watch. Not to mention, the soundtrack is iconic and gave me songs that shaped my childhood. omnivores. For food, Coriander enjoys dubia roaches, crickets and even salad. McGraw said he loves mango, squash and leafy greens. Cori, for short, lives in a large 40-gallon terrarium in McGraw’s guest room and is little trouble to take care of. He’s low maintenance and easy to keep happy, said McGraw. “I just need to feed him every other day and occasionally give him a bath,” said McGraw. Bearded dragons weren’t introduced into the United States until the 90s, according to Bearded Dragon Guide. juveniles tend to be more carnivorous than adults, according Pet Guide. He eats turtle pellets bought from the store. “I take him out and let him roam around my room,” said Hall. However, Crush can be a lot of work to take care of. Hall has to clean his tank and make sure the light and tank is the right temperature. “Turtles are a lot of work to keep. I need to clean his tank pretty often because he poops a lot,” said Hall. What action should be taken about students Parking in handicapped spots?